Honour DVD release date was set for September 16, 2014. 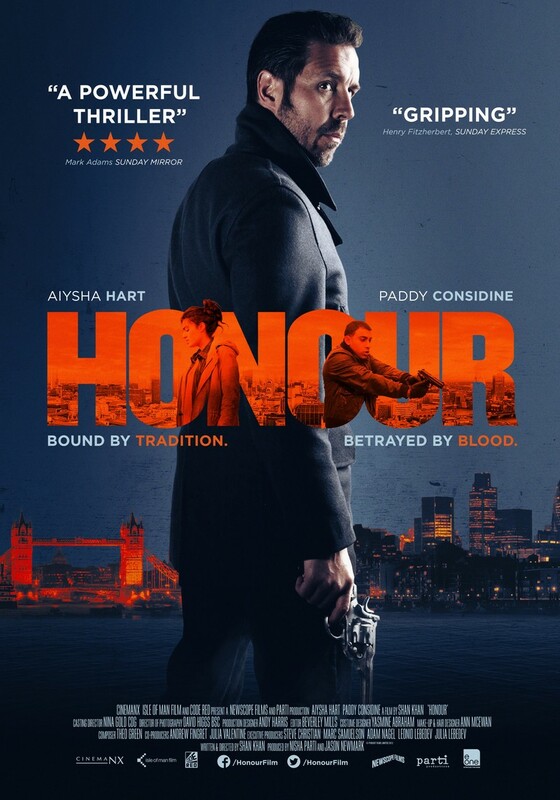 Honour is a 2014 British revenge action-drama and thriller directed by writer and producer Shan Khan, featuring the "honor killings" of the proliferous British-Asian Muslim community. Starring Paddy Considine from The Bourne Ultimatum, Aiysha Hart, and Nikesh Patel, the movie sets a bounty hunter who is set by a conservative Pakistani immigrant family to find their daughter Mona (Hart) after disgracing her family's name by dating another Muslim Punjabi named Tanvir (Patel). As such, the family desperately turns into a racist ex-convict-turned-bounty hunter to track Mona down and (probably) kill her; however, after a botched murder attempt by Mona's brother, Kasim (Faraz Ayub), they turn to the bounty hunter's services once again. A mixture of thriller, action, suspense, social realism, and non-linear narratives designed to portray the narration as unreliable and notched, Honour focuses on the emotional impact of the "culture wars" in Britain, laced with sensationalism through exposed escapism.